Advanced Projects in Woodwork (from Google books), Ira Samuel Griffith (1912). Contains many excellent craftsman-style furniture projects, though really for advanced woodworking. Just provides drawing with dimensions; the rest is up to you. Sharon would really like to figure out how to make this wastebasket. Amateur Gardencraft: A Book for the Homemaker and Garden Lover (from Google books), Eben Eugene Rexford (1912). 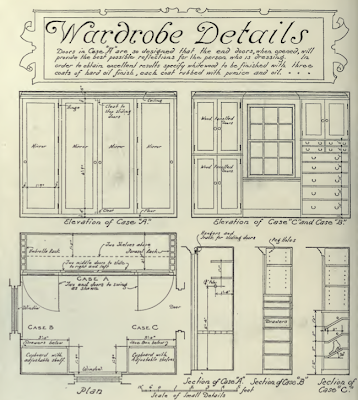 Amateur Joinery in the Home: A Practical Manual for the Amateur Joiner on the Construction of Articles of Domestic Furniture (from Google books), George Ashdown Audsley, Berthold Audsley (1916). 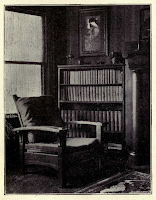 Beautiful Home Surroundings (from Google books), George Wyman (1922). 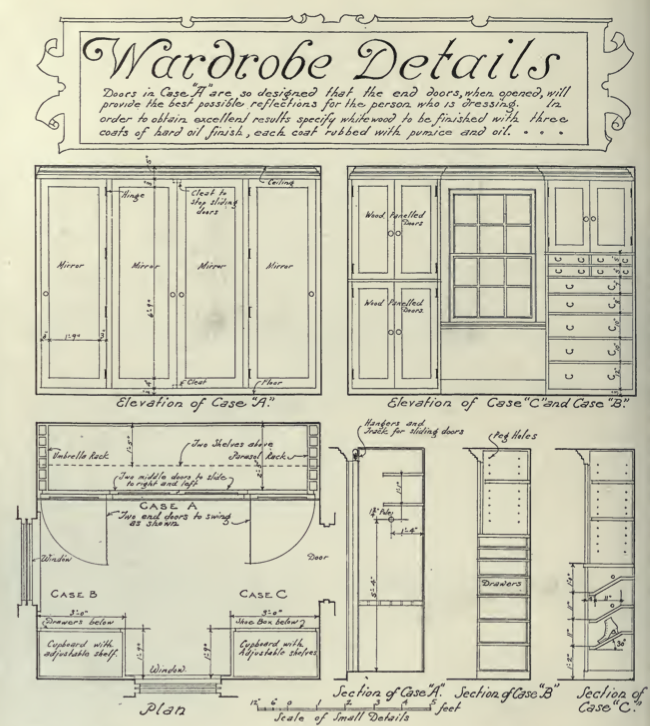 Cabinetwork and Joinery, Comprising Designs and Details of Construction with 2,021 Working Drawings and 12 Colored Plates (from Google books), Paul Nooncree Hasluck, ed. (1908). Mostly Victorian-style projects, but there are some simple craftsman style projects in this book. Fairly advanced skills required. 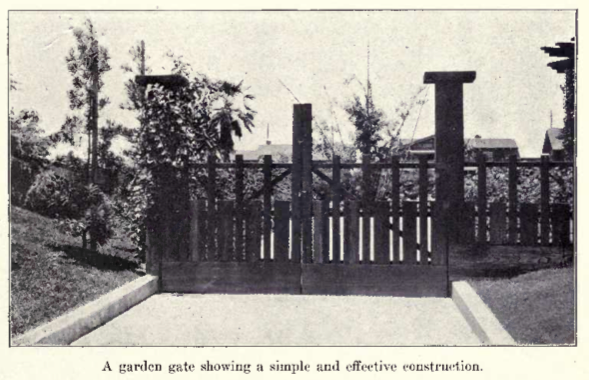 California Gardens: How to Plan and Beautify (from Internet Archive), Eugene Otto Murmann (1914). This book has some really beautiful landscapes, but the pictures are geared toward "Estates," not tiny city lots. Have a few suggested yard layouts for small lots. 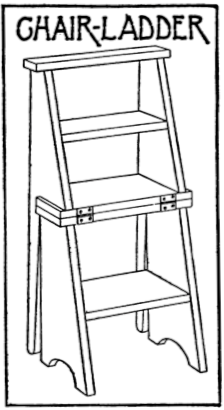 Carpentry for Beginners: Things to Make (from Google books), John Duncan Adams (1917). This chair-ladder project is quite neat—though it seems to be more of an intermediate level project based on their description that construction should be obvious; the author does spend a bit of effort to explain the construction order. Book also includes several craftsman-style projects. Hopefully someday Sharon will be skilled enough to make some of the chair projects! Drying Clay Wares (from Google books), Ellis Lovejoy (1916). Essentials of Woodworking: A Textbook for Schools (from Internet Archive), Ira Samuel Griffith (1915). Furniture for Small Houses; A Book of Designs for Inexpensive Furniture, with New Methods of Construction and Decoration (from Internet Archive), Percy Wells (1920). 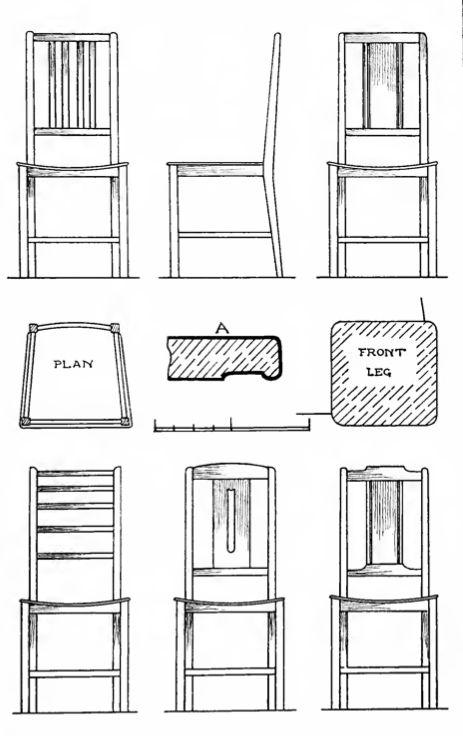 Some nice diagrams for simple mission-style furniture, like the chair diagram to the left. Furniture for the Craftsman (from Internet Archive), Paul D. Otter (1914). The "Craftsman" they're referring to is the skilled furniture maker, not the Craftsman-style home. This book is mostly drawings of furniture in a variety of styles from the period. Garages, Country and Suburban (from Google books) , various authors (1911). Great Western Pottery Company, Permanent Catalog Illustrating & Describing Vitreous China Sanitary Ware (from Internet Archive) , (1911). Shows only one complete bathroom setup, but shows a lot of options for china fixtures for bathrooms and kitchens. Handbook in Woodwork and Carpentry (from Google books), American Book Company (1911). Illustrations of the House Beautiful, Designed to Help All Persons Interested in the Beauty of Their Homes (from Internet Archive), Herbert S. Stone & Co. (1902). Inside the House Beautiful; A Collection of Interior Views Showing Furnishings and Their Arrangement (from Internet Archive), Henrietta C. Peabody (1921). This book has photos of actual period interiors, not drawings, though, they are mostly white-painted interiors. Some good furniture arrangement and curtain ideas. 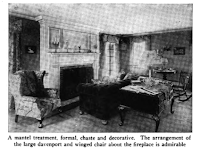 Inside the House of Good Taste (from Google books), Richardson Little Wright, ed. (1915). This book also includes photos of actual interiors and they give more examples of rooms with unpainted woodwork. Some nice examples of furnished rooms and how not all pieces have to be mission style. Also interesting as there appear to be no coffee tables and the couches seem to be placed quite close to the fireplace. Lamps and Shades in Metal and Art Glass (from Google books), John Duncan Adams (1911). Making a Garden of Perennials (from Google books), William Egan (1912). This book includes a good list of dependable perennials along with lists of soil and sun requirements. Might help with bungalow garden plant selection. 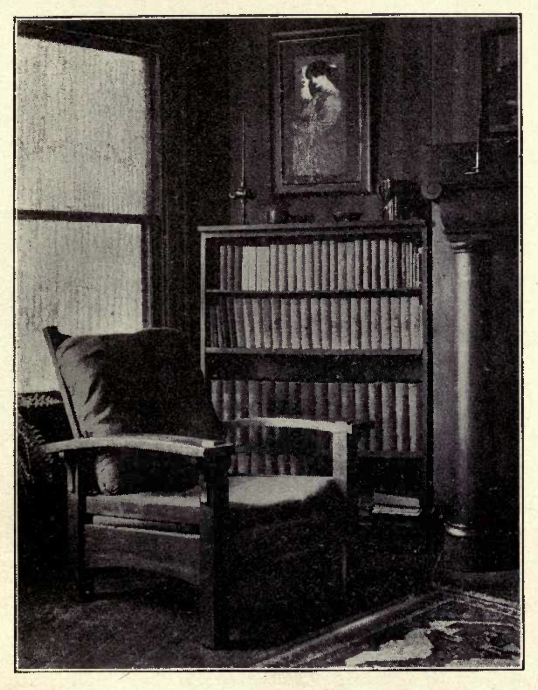 Making Built-In Furniture (from Google books), Abbot McClure (1914). 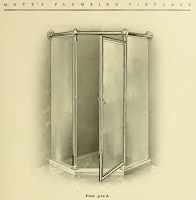 Making Floors (from Google books), Abbot McClure (1915). Making Paths and Driveways (from Google books), C.H. Miller (1912). Miss Beecher's Housekeeper and Healthkeeper: Containing 500 Recipes for Economical and Healthful Cooking; Also, Many Directions for Securing Health and Happiness (from Internet Archive), Catherine E. Beecher (1873). 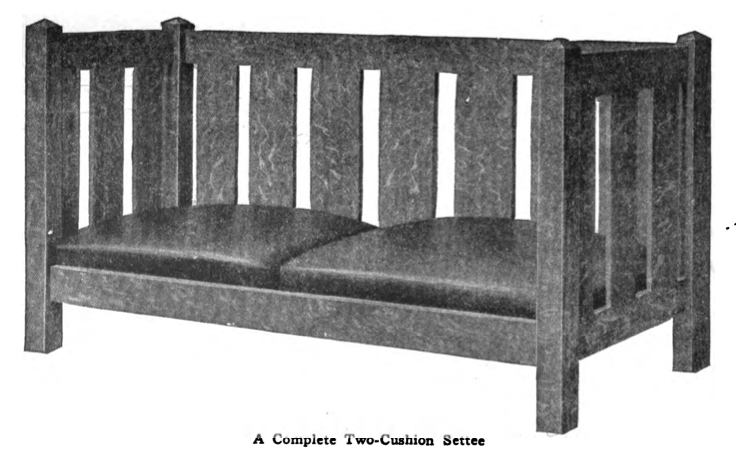 Mission Furniture: How to Make It, Volume 1 (from Google books), Popular Mechanics (1909). This is probably the best furniture making how-to of the bunch. 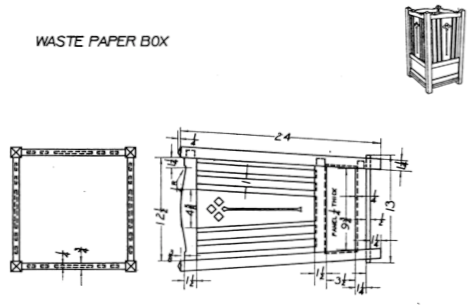 They include drawings of the finished pieces, material lists, diagrams, and some directions for construction. 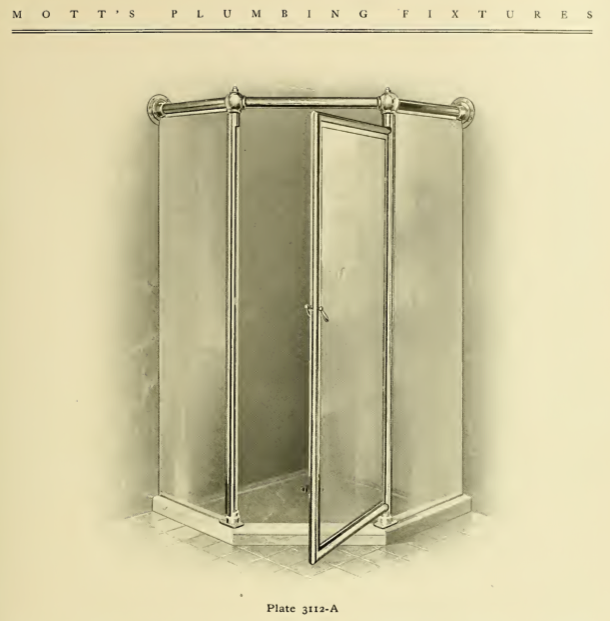 Mott's Plumbing Fixtures catalog (from Internet Archive), J.L. Mott Iron Works (1907). OMG, this is the best bathroom catalog! Tons of complete bathrooms, decent resolution on pictures. It's quite a score! Sharon even found a bathroom with just a shower in the corner (no bathtub!!). Principles of Domestic Science: As Applied to the Duties and Pleasures of Home (from Internet Archive), Catherine E. Beecher (1870). Projects for Beginning Woodwork and Mechanical Drawing (from Internet Archive), Ira S. Griffith (1919). Stained Glass Work: A Textbook for Students and Workers in Glass (from Google books), Christopher Whall (1905). A basic how-to but not many diagrams/drawings. Also included information on painting medieval-style stained glass pieces. 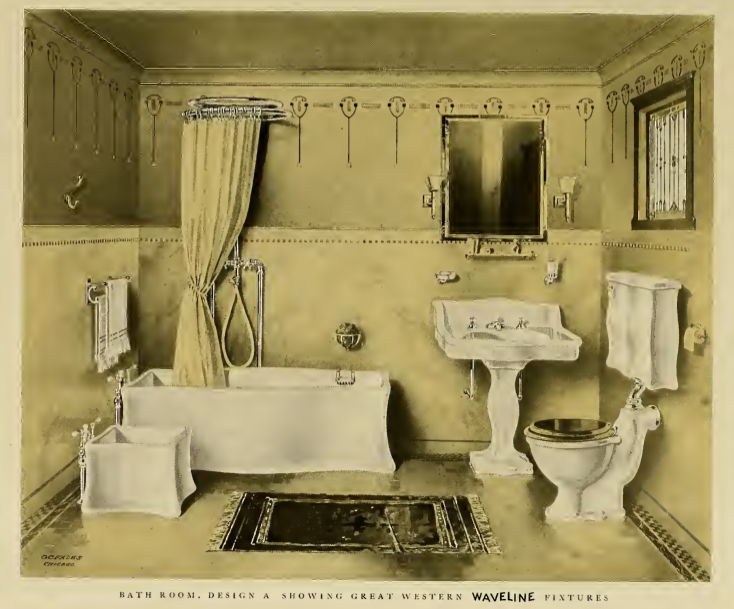 Standard Ideal Bath Catalog: Baths, Lavatories, Sinks, Laundry Trays (from Internet Archive), (1910). 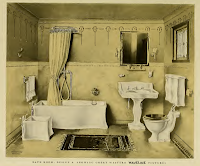 This is an awesome period bath catalog with images of bathrooms and available fixtures. Unfortunately, it's a poor scan, so the pictures are not real clear. Suburban Gardens (from Google books), Grace Tabor (1913). Offers suggestions for overall landscape layout for a variety of shapes and sizes of yards. Also includes some suggested plant lists. Wish there were more pictures. The Boy Craftsman: Practical and Profitable Ideas for a Boy's Leisure Hours (from Google books), Albert Neely Hall (1905). The Efficient Kitchen: Definite Directions for the Planning, Arranging and Equipping of the Modern Labor-Saving Kitchen—A Practical Book for the Homemaker (from Google books), Georgie Boynton Child (1914). The Furnishing of a Modest Home (from Internet Archive), Fred Hamilton Daniels (1908). Lots of photographs from actual period interiors, primarily interiors with unpainted woodwork! The Home Painting Manual: A Complete Handbook on Home Painting and Decorating, Full Information about Paints and Varnishes and Their Application (from Open Library), Sherwin-Williams Co. (1922). The New Housekeeper's Manual: Embracing a New Revised Edition of the American Woman's Home; or, Principles of Domestic Science. Being a Guide to Economical, Healthful, Beautiful, and Christian homes (from Internet Archive), Catherine E. Beecher (1873). 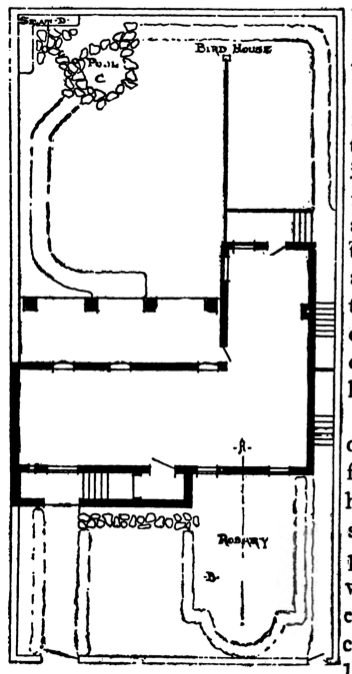 What Makes the House Beautiful; A Collection of Building Details with Measured Drawings (from Internet Archive), Henrietta C. Peabody (1920). Includes hard-to-find information on closet and wardrobe finishing. Woodworking for Beginners: A Manual for Amateurs (from Google books), Charles Gardner Wheeler (1907).